The goal of Cavallo’s Lesson Program is to provide a complete hands-on experience with horses. At Cavallo, riders age three and up learn to be careful and respectful with horses, and at the same time, take charge and be a leader. We feel that consistent riding lessons builds confidence, strength and skills. Beginner lessons include 15 minutes of grooming and tacking up, 30 minutes of riding and 15 minutes of untacking and putting away their horse. Intermediate and Advanced riders will ride for a full hour and be responsible for tacking up and untacking their horse on their own. Our program is operated by Jaymi Garrett. Jaymi brings a lot of knowledge and experience to our team. She is gifted with a great teaching technique that motivates her students and she is dedicated to seeing them grow as equestrian athletes. 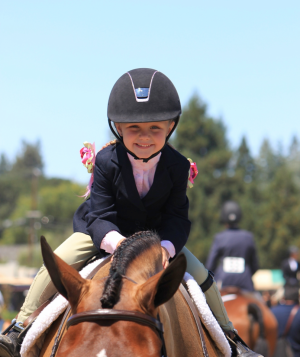 Pony Pals is for our youngest riders who might not last a full hour. It is a 30 minute pony playtime to groom, ride or just play with real ponies. Cancellation Policy: We require 24 hours notice to NOT be charged for your cancelled lesson. No shows will be charged the full amount. Lesson Payment Policy: Lessons are to be paid for on the day of your lesson in cash or by check made out to Cavallo Stables. Package Payment Policy: Packages will be billed via email between the 1st and 5th of the month. Payments are due upon receipt, deemed late 3 days after the payment is sent and subject to a $25 late fee, plus $2 a day thereafter. No lessons will be given until your late payment is received.